The entire world is stunned by the dramatic changes in the values of cryptocurrencies. In 2017, we have seen many cryptocurrencies touching all time high values. Bitcoin tops the list with Ethereum and XRP as the followers. The overall market cap of all the currencies has crossed $700 billion. All this is happening due to usefulness of blockchain technology in these currencies. The overall focus of all these platforms is to speed up the cross border transactions. Ripple has earned a special honor in this case because its blockchain processes the cross border transactions within three seconds. XRP is a cryptocurrency. Ripple is a payment platform based on open source protocol. Like all other virtual currencies, it uses blockchain technology for faster cross border transactions. Over the past few months, the reliability, security, and scalability of this platform have made it one of the top payment platforms and cryptocurrency in the world. Ripple’s payment protocol processes the cross border transaction in just three seconds. The professional team behind Ripple has invented many blockchain based solutions. These include cryptocurrency XRP, xCurrent application for banks, xRapid for payment processors, and xVia for businesses. XRP had broken many all time high records in the last week of December 2017. The currency even touched all time high of $3.80. This also made it the second largest cryptocurrency in the world with market cap of over $140 billion. This surge in the value of Ripple (XRP) was due to joining of large banks and payment platforms. The second largest money transfer firm MoneyGram has also announced to adopt Ripple’s payment protocol for transferring cross border payments. The joining of American Express, Santandar, and many large Japanese banks and credit card companies has played a crucial role in increasing the price of this digital currency. Following are some of the differences between XRP and other cryptocurrencies that have made it one of the top payment platforms across the world. The very first difference between XRP and other cryptocurrencies is the speed of transactions. XRP beats all other cryptocurrencies in processing cross border transactions. Due to mining process in other cryptocurrencies, the transactions take longer times to complete. In Ripple, a cross border transaction completes in just three to four seconds. XRP is also superior to other cryptocurrencies because it is not created by the users through mining process. Instead, the company itself has created 100 Billion XRP coins. Here, it is also important to mention that 55 Billion out of these are saved as escrow payment to increase the reliability of this payment platform. Investing in XRP is also beneficial because it is works on a decentralized blockchain network. This means that the investors can buy or sell Ripple (XRP) through the secure system of the company. On the other hand, other cryptocurrencies are bought or sold through central exchanges that can crash anytime and render the users a great loss. As Ripple works as a payment protocol, it takes a little transaction fees. However, these fees are being minimized gradually. 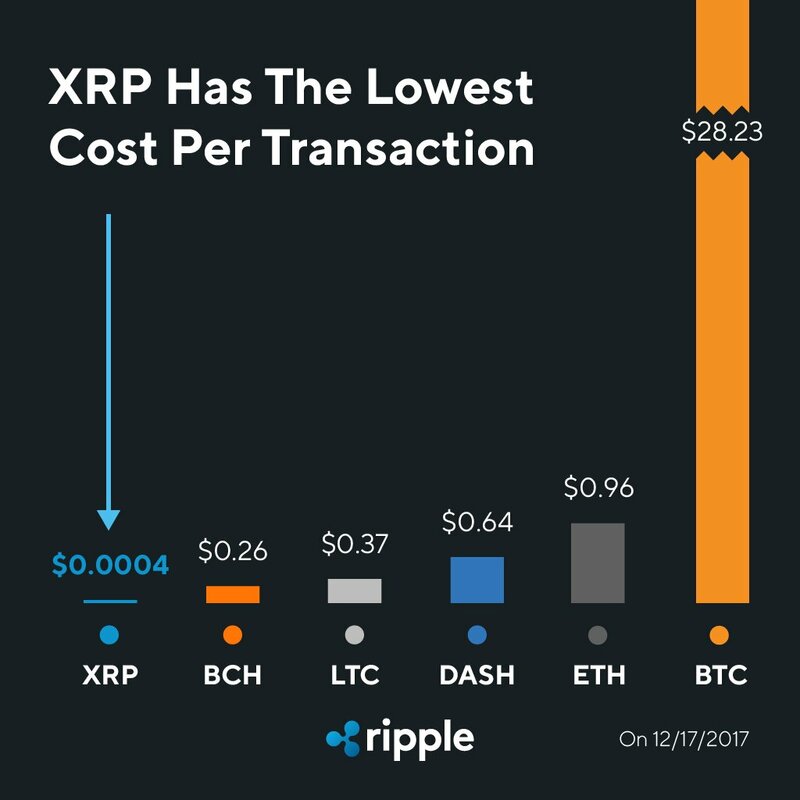 The other cryptocurrencies take more transaction fees than Ripple. Thus, XRP is clearly the winner here too. Ripple offers more security as the company can track any sort of information in its network. The other cryptocurrencies do not offer this information tracking. These can only track the inflow or outflow of coins while Ripple can track even the account balance of the users. Most of the people think that XRP works like all cryptocurrencies. They also think it as a coin that increases in value with the passage of time. But, the reality is not so. First, Ripple is not a coin but it is a payment platform that helps in fast processing of cross border payments. Ripple takes the place of banks in this kind of transfer. It works exactly like banks in transferring money from one place to the other. It chooses its nodes carefully for processing transactions. One thing very impressive in its working is that it does not allow any third party to interfere in the transactions. This means that it controls the transactions through its own blockchain network. This decreases the completion time of transactions. This increases the security, reliability, and scalability of the transactions. It allows the transfer of coins from one account to the other through unique and verified nodes. The processing of transactions takes place through two ways verification. All the transactions are saved in an online ledger which is continuously updated by Ripple. All the information about the transactions is saved by the company and no information is leaked. Unlike all other cryptocurrencies, Ripple knows all about accounts, their balances, various transactions, and much more. Is XRP Worth Buying in 2019? – Yes It Is, In My Opinion! Cryptocurrencies have seen a great boom in 2017. Ripple XRP showed an increase of about 35000% during 2017. The currency started its journey from $ 0.006 in January 2017 and reached almost $2.80 in the end of December. Not only this, XRP has touched an all time high $3.80 in the first week of 2018. This entire boom was due to adoption of Ripple’s blockchain technology by many large banks and payment companies. The news of joining of many Japanese banks and payment companies has increased the trust of investors in the currency. The crypto experts are of the view that XRP is the cryptocurrency that will show a lot of bullish signs in 2019. This is because of the joining of many large banks, financial institutions, and credit card companies. Ripple’s ecosystem is expanding rapidly and more and more companies are joining it. Especially, the joining of American Express and Santandar has benefitted it a lot. Ripple XRP is the only cryptocurrency that has eased the transfer of money between America and Europe. The businesses between these two countries are expanding. many Japanese banks have announced to adopt Ripple as a mode of payments. Also, a lot of Japanese credit card companies have joined Ripple to pay their customers. The adoption of Ripple by SBI Japan and Asia is very important in this regard. Also three large companies have also announced to join Ripple’s payment protocol for cross border money transfers. The world’s second largest money transfer firm MoneyGram has started the test launch. Both ripple and MoneyGram has announced their tie-up. This has played a crucial role in surging the price of Ripple XRP. Here, it is important to mention that XRP Price and all cryptocurrencies has shown a temporary decline in 2018. On the other hand, the crypto experts are of the view that XRP would beat Bitcoin and all other cryptocurrency if its value touches $7-$10 in this year. This is because on reaching $7 value, the market cap of this cryptocurrency will cross Bitcoin which is the largest cryptocurrency in respect of market cap. Here, it is important to mention that XRP has touched an all time high value of $3.80 in the first week of 2018. The market cap of the digital currency crossed $140 billion, and it became the second largest crypto currency of the world. Seeing this, we can hope that XRP will surely touch $7 mark in 2019 as more and more companies are planning to join Ripple’s blockchain network. Moreover, Ripple’s blockchain technology is worth using because it helps to complete cross border transactions within seconds. The currency is 10 times stronger than Bitcoin and other prominent cryptocurrencies of the world. Thus, the investors are thinking of investing in Ripple (XRP) because the value of cryptocurrency may touch an all time high record. Also, if the regulations for controlling the flow of funds through virtual currencies are launched, XRP would certainly be the largest cryptocurrency to ease the cross border transfers. This is because it is not only the currency, but is a payment platform that uses latest blockchain technology for money transfers. Brad Garlinghouse is also hopeful that many more payment companies, banks, and financial institutions will join its ecosystem and this will increase its value. How Can You Buy Ripple XRP? As Ripple is going to be the worth buying cryptocurrency in 2019, it is necessary to mention here the ways to buy this currency. XRP can be bought either through USD by using Debit/Credit Card or through exchanging with other cryptocurrencies like Bitcoin, Ethereum, and Litecoin Let us explain both these buying methods in detail. Coinmama is one of the largest crypto exchanges that offer trading in various cryptocurrencies across the world. This exchange is headquartered in Israel and operates all over the world. The exchange has more than 1,0 00,000 customers across the world. The exchange has recently announced the support for Ripple XRP. The investors warmly welcomed this decision because the exchange also offers buying cryptocurrency through credit/debit cards. One of the most attractive features of this exchange is that it offers higher limits of buying XRP tokens than all other crypto exchanges operating across the world. The users can buy XRP tokens of worth $5000 at a time. Also, the customers can buy XRP tokens of worth $20,000 in a month. It is also one of those exchanges that also accept large number of fiat currencies. The exchange takes 6% transaction fees on almost all the transactions. This means that the exchange takes a little higher fee than other exchanges. This is because the growing database of the exchange is increasing the liquidity of the exchange. Following are the pros and cons of this crypto exchange. It has wider operations all across the world. 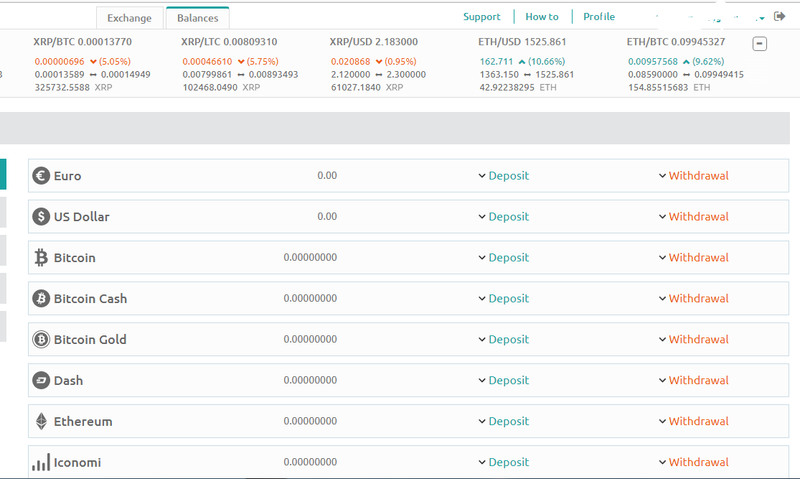 The exchange has very beautiful and attractive user-interface. Offers trading in many cryptocurrencies. Also, accepts payments in many local currencies. Offers higher buying limits than other exchanges. Accepts payments through credit cards. Does not offer cryptocurrency selling facility but provides only trading facility. How to Buy Ripple XRP through this Exchange? Buying Ripple XRP through this exchange is like buying other coins. The users can buy any of the available tokens by trading or paying through their credit/debit cards. The very first step for buying Ripple XRP through this exchange is to register with the exchange. Here, it is worth mentioning that this exchange operates through a website and does not have mobile application. The users can register with the exchange by visiting the website of the exchange. There is a Sign up tab on the top right corner of the web page. Clicking the Sign up tab will open a form to fill. The users have to fill in their first name, middle name, last name, email ID, and then select the country of their residence through a down click arrow. Accepting the terms and conditions of the exchange will create the user account. The exchange offers buying XRP tokens of worth $150 without any verification. But, for buying large amount of cryptocurrency, the users have to go through KYC and AML verification processes. These processes may require passport, driving license, or the Identity Card of the users. The documents provided should have your name, age, gender, address, date of birth clearly visible. The registration process is completed in just 10 minutes. After the process completes, the users can buy Ripple XRP coins of worth $500 at a time. 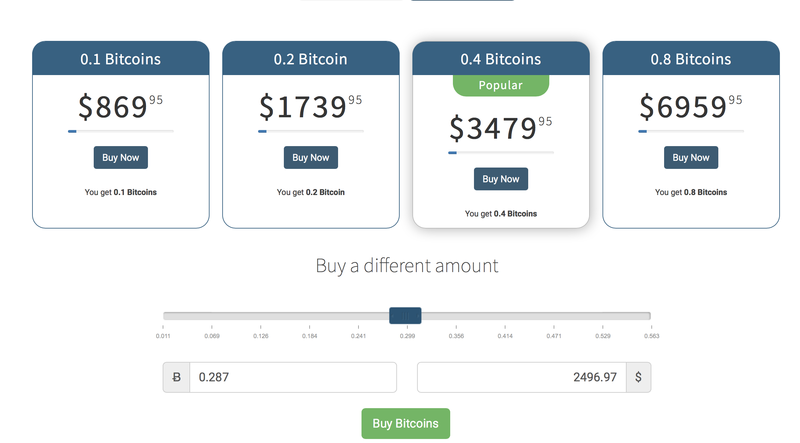 The users have to select the currency to pay and the amount of XRP tokens they want to buy and click the buy button. One of the largest problems that the investors have to in buying Ripple is buying Ripple XRP with bank, debit card and credit card. . This is because only a few of exchanges give you the option to directly buy XRP through your credit/debit cards. For most of the times, you have to buy Bitcoin or any other cryptocurrency and then exchange it with Ripple XRP. No need to worry now because Changelly has solved this issue by offering buying Ripple XRP through credit/debit cards. Here, it is also important to mention that Changelly has become a lot popular due to offering cryptocurrencies directly through credit/debit cards. You only need a valid Ripple wallet address to buy coins from this exchange. Following are the main steps in buying Ripple XRP through this exchange. Registration with this website is quite easy and free. You can register through a signup button on the right top of the page. The registration only requires a valid email ID so that the website can send you the username, password, and other necessary information related with the registration. Here, it is also important to mention that this website does not charge any fee. You have to pay only when going through a transaction. After creating profile on Changelly, you have to go to home page for selection of the crypto currency you want to buy. You can also select the currency in which you want to pay for Ripple coins. After making right selections through arrow keys, you can press the next button on the page. It will take you to the login screen if you are not logged in. But, if you are already logged in pressing next would take you to the order confirmation page. 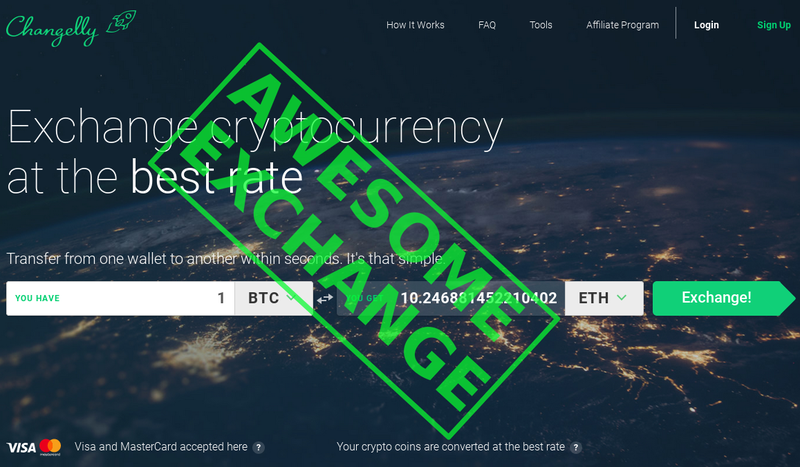 Here, it is also important to tell you that Changelly also provides you the exchange rates for various currencies on this page and you can select the currency of your own choice by seeing these exchange rates. Here, you are asked to check all the details of your order and press next. This page will also tell you the estimated time of reaching of XRP into your wallet. As already mentioned, you need to have a valid wallet address for storing your coins. There are a lot of online wallets available but Ledger Nano S is the best of all. Here, it is pertinent to mention that some wallets offer address tags to the users. 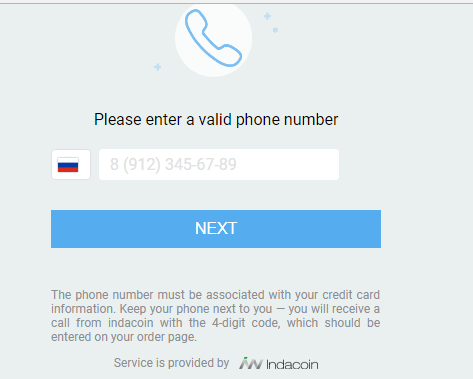 After entering the wallet address and address tag if provided, you can proceed by pressing the next button. Here, once again Changelly will ask for confirmation. 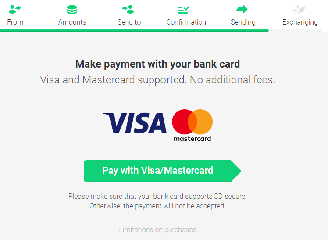 As you are going to buy Ripple XRP through credit/debit card, the screen will show pay with Visa/Master Card. Clicking this tab will take you to the new page where you will have to enter your credit card details. After filling all the information, click on pay button. Here, once again the amount you are going to pay will be displayed. Changelly will ask you for confirmation through sending an SMS to your registered mobile number. Entering this code onto the page will confirm your payment and order. You can also confirm through other ways except SMS confirmation. This is either through a code on email address or your picture with your ID card or Passport in the hands. In this case, a unique code will be sent to you within 15 minutes. Through entering this code, your payment and order will be confirmed. After entering the confirmation code, you transaction will complete and you will receive your coins within 5-30 minutes. The receiving time of the coins also depends on the wallet address. Ledger Nano S , here, once again takes the lead as transfer of coins in this wallet takes place rapidly. Here, one thing worth mentioning is that the first transaction takes a considerable time because a lot of confirmation is required by the company. The transfer speed of the coins also depends on the policies of the wallets. Ripple is the third largest cryptocurrency of the world. But, it is not much popular and cannot be bought easily as other cryptocurrencies. One of the easiest ways to buy XRP is through exchanging XRP with other cryptocurrencies like Bitcoin and Ethereum. Following are the steps to buy XRP through Bitsane. 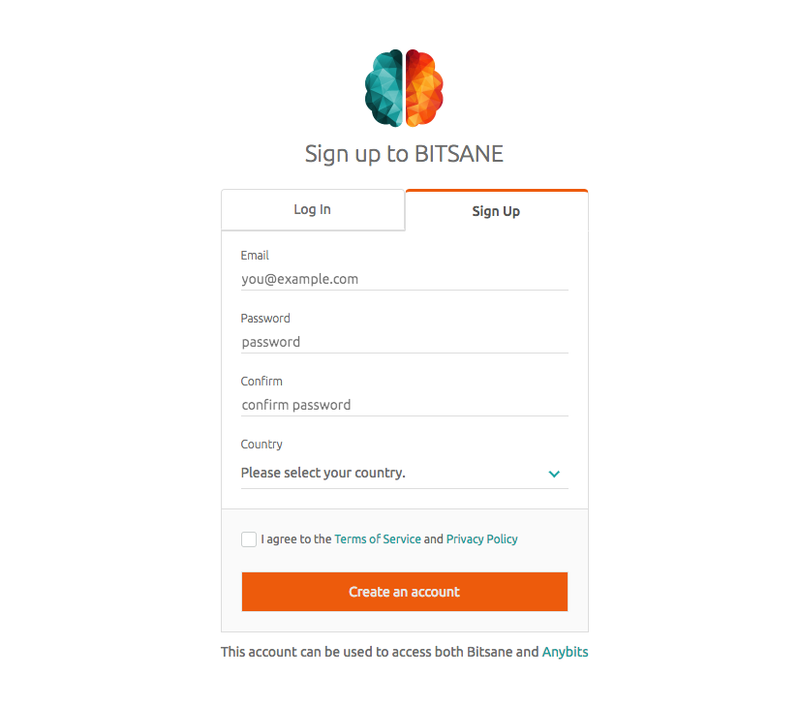 The very first and the most important step in buying Ripple XRP through Bitsane is registration with the exchange. Here, once again it is pertinent to mention that most of the exchanges across world do not offer XRP. But, Bitsane is the exchange that offers you to Exchange Bitcoin/Ethereum/Litecoin..To Ripple XRP and Bitsane also allow you buy XRP through US dollars & Euro. You will have to buy Bitcoin or Ethereum through any of the cryptocurrency exchanges. CoinMama are the best exchanges to buy cryptocurrencies like Bitcoin and Ethereum. Follow our guide on how to buy bitcoin and ethereum for this step. Follow our guide on how to buy Litecoin Using Changelly for this step. After buying Bitcoin or Ethereum, you will have to transfer these coins to Bitsane. This step seems complicated to some users but it is the easiest way to buy Ripple (XRP). For this you will have to go through following steps. Click on the “balances” on top of the Bitsane. Selecting ethereum or bitcoin press deposit. Copy the address generated by the previous address. After reaching your wallet, click the send button and specify the amount to send. Enter the copied address and click send. You will have to pay minimal fee for this. After your Bitcoin or Ethereum reaches Bitsane, you can buy Ripple (XRP) through exchanging. For this, you will have to select exchange XRP/ETH. This will allow you to buy XRP. Choose the order size and market to buy Ripple. Now, you can check the quantity of Ripple XRP that reaches your account. As the value of Ripple is lower than Bitcoin and Ethereum, you can buy large amount of XRP. Later, you can exchange these coins to buy Bitcoin or Ethereum and exchange these with physical currency. These Ripple coins that you have exchanged with other cryptocurrencies reach your wallet. Here, once again the receiving of the coins in your wallet depends on the selection of wallet. Different wallets offer different speeds. Ledger Nano S is the best wallet in this regard which provides the user with best speed. The exchanged coins reach your Ledger Nano wallet with 30 minutes of the exchange. Except exchanging Bitcoin or Ethereum with Ripple, Bitsane also offers you to buy Ripple (XRP) directly through US dollar. This Irish exchange offered the XRP trading in June 2017. The users can buy XRP directly through USD currency. For this purpose, they have to register with Bitsane. The registration requires a valid email ID and is absolutely free. On the homepage click the sign up button and fill up all the necessary information. Thank you so much for the guide, it´s a great tool to gain deeper understanding in the use of ripple and how the other currencies work. Are you going to continue doing the technical analysis you did in 2017?? For me are well done and keeps me alert of changes or limits in the weekly movements. It would be great if you keep doing the analysis for all the users of the website. Hello, is it possible to have a paper wallet wit Ripple? hi ahmadderar this is my third time asking you for help with my nano s didnt reply to my first two.i cant ripple from ledger manager onto nano s there seems to be no support from Ledger or from you who advertise it as the best and now i feel like you scamed me . can you tell me what is your problem please ? you can’t send ripple to ledger ? I am not understand what you mean. can you explain please ? I am not here to scam anyone, I am here to help anyone need help and all my articles for help people and I will be happy if I can help you ..